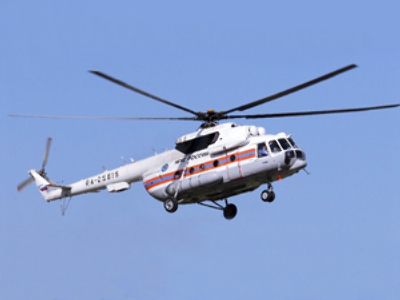 A helicopter from the Ministry of Emergency Situations has arrived at Gorno-Altaysk in Russia’s Far East to collect the bodies of the victims of the helicopter crash, a ministry spokesperson said on Monday. Inspectors from the Public Prosecutor’s Office have also arrived at the scene. Three of the four survivors of the Friday’s helicopter crash have been taken to the city of Barnaul so that they can be treated at one of the city’s hospitals. The fourth has been taken to hospital in Kosh-Agach. A helicopter from the Ministry of Ebergency Situations set off for Barnaul from the village of Aktash on Sunday afternoon. It was originally supposed that the victims would receive medical help in the hospital in Aktash. However, it was decided to transport them to Barnaul instead. Barnaul is one of the major cities of the region. The fourth survivor of the crash, second pilot Maxim Kolbin, was taken to hospital in the settlement of Kosh-Agach on Sunday. A doctor at the hospital said that Kolbin’s life was not in danger. However, doctors have refused any interviews with the survivor. The police reported that Kolbin left the scene on foot and walked 40 kilometres to seek help from frontier guards. The wreckage of the Mi-8 helicopter that went missing on Friday was found near Mount Chernaya in the Altay Republic in Russia’s Far East. The bodies of seven people were discovered at the scene. Rescuers also found four injured survivors in the area. “From the place of the accident, the injured men, one of whom is the second pilot, have been taken aboard an aircraft of the Ministry of Emergency Situations,” said Vladimir Markin, an official representative of the investigative committee. According to the rescuers, the helicopter was completely destroyed. There were 11 people onboard the helicopter. Among them are known to have been the envoy of the President in the State Duma, Alexander Kosopkin, the vice-premier of the government of the Altay Republic, Anatoly Bannyh, the chief of the republican committee on theprotection of fauna, Victor Kaimin. The Russian President Dmitry Medvedev has already sent his condolences to Kosopkin's family on their loss. The Mi-8 helicopter belonged to the Tomsk office of Gazpromavia. The helicopter was following the route from the city of Biisk to Chemal-Kosh-Agach in the Republic of Altay. It was a commercial flight under contract with a local businessman. All necessary documents on the operation and preparation and of the flight had been issued without infringements, according to reports from the Western-Siberian Transport Office of the Public Prosecutor. The investigative committee has taken samples of the fuel used for the flight for examination. Police have not yet ruled out the possibility that bad fuel might be the cause of the Mi-8 crash. The helicopter is equipped with an emergency radio signal, which allows the crew to send Mayday signals. However, the rescue team believe it’s possible the signal was out of order. Contact with the helicopter was lost at 2 pm local time (8 am GMT) on Friday.